As the leaves turn from green to crisp golds and yellows, it’s a reminder that fall weaning is right around corner. Many weaned calves will be making their way to feed lots across the Midwest. As the time comes to market calves, producers are always looking for ways to capture extra profit, and the buyers are looking for the calves from the best managed herds where health and nutrition are priorities. With the help of value-added programs, sellers and buyers can both gain added premiums for the calves that qualify and are enrolled in these programs. Superior Livestock Auction has been a leader in value-added programs since the mid-1990s, and in 2017, BioZyme® Inc., became the first-ever nutrition company to partner with Superior on two programs. The VitaFerm® Raised and VitaFerm Gain Smart® Programs were designed to ensure that calves have been on a high-quality nutrition program, an important part of overall health. Calves sold through Superior were either being raised on a cow that was being fed the VitaFerm mineral, or calves that had been weaned previously were being supplemented with VitaFerm Gain Smart. Both minerals contain Amaferm®, a precision prebiotic designed to enhance digestibility by amplifying the nutrient supply within for maximum performance. “Nutrition has always been important, and people have always paid attention to how healthy the cattle are. A program on nutrition helps bring to the forefront how important that health component is,” said Danny Jones, President at Superior Livestock. Jones said that Superior had an excellent Summer sale run, marketing nearly 800,000 head in its four big sales. The most notable thing he witnessed is when there was a tough day in the market, the first animals to drop in price were cattle not enrolled in any value-added programs at all. “We noticed more and more differentiation in what the buyers are willing to pay for in terms of value-added. On the days the market was tougher, the value-added programs seem to continue to sell really well; the first thing that would come off would be something with no value-added. We continue to believe in and promote value-added programs across the board. That was evident this summer,” Jones said. Ty de Cordova is a Superior Rep who believes in and promotes the value of a high-quality nutrition program. Although exact figures won’t be calculated until the year ends, he could tell by attending the sales and watching cattle sell that quite a few more VitaFerm Raised and VitaFerm Gain Smart cattle sold this summer compared to last. Ralph Wade, Auctioneer for Superior, sold a lot of the cattle this summer, and he agrees with de Cordova on the value of a good nutrition program – both for the seller and the buyer. “From the standpoint of being behind the mic, we could tell them they are on the VitaFerm program, and we could see the increased interest; how much better they were being received by the buyers and they were actually paying up for the cattle and rightly so when you think about the value they are adding to the health program,” Wade said. Wade compared healthy people to healthy cattle – those on a good vitamin program are typically healthier and have to spend less time getting doctored and less money on medical bills. He said as more and more research proves the value of a high-quality mineral program, he predicts the value of these cattle will increase as well. Steve Harrison is a buyer who says the value of a healthy animal for the natural beef business is paramount. As the senior director of opportunities, or the person who oversees commercial cattle procurement at 44 Farms, which has a “never, ever” natural and branded beef business, Harrison buys loads of calves through Superior, and he is willing to pay more when he sees that VitaFerm Raised logo. “People that use VitaFerm products see it as an icon of quality. If they are making the investment and spending time and money on a mineral program like VitaFerm, that says their cattle are pretty important to them, so they are probably doing things equally as well to balance out their operation to be good producers,” Harrison said. As for the natural beef program at 44 Farms, they know that good calf nutrition starts with the cow. They buy back calves from their customers, and have a producer meeting each spring to talk about cattle and encourage those producers to feed a high-quality mineral. “Managing health is managing the bottom line, and a compromised immune system is the number one risk factor when bringing calves into the feed yard on why they break the way they do. Mineral supplementation at the cow-calf level is a really good insurance policy that all your vaccines and everything you do with your management is going to assure the transition from good health at the ranch to good health at the feed yard,” Harrison said. Yes, added value is available to both the seller and buyer in something as simple as a nutrition program. As we shift into fall, the market seems to remain strong, and for those program cattle, that means even more in premiums. And just as the leaves change color with the seasons, so do the temperatures. 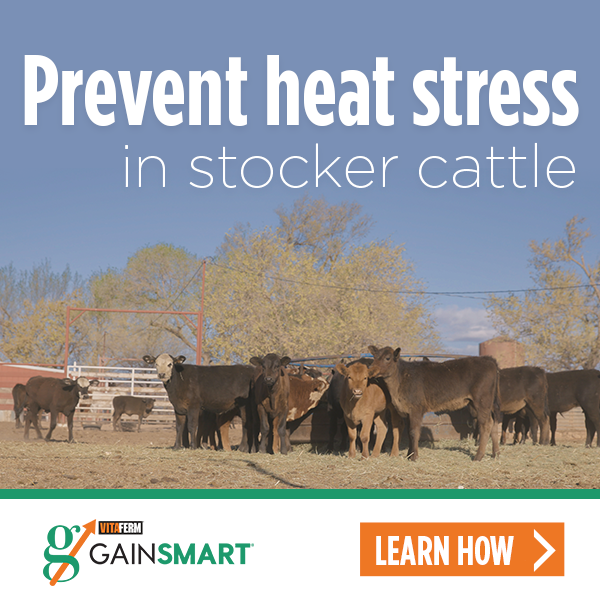 de Cordova reminds feeders that a good nutrition program can help keep cattle healthy with these extreme temperature shifts. “With the fall weather and changing temperatures from day to night, anything you can do to keep cattle healthy is a benefit,” he said. To learn more about the VitaFerm Raised value-added program through Superior, visit: http://www.superiorlivestock.com/ or http://vitaferm.com/superior.